'Wonder Woman' Movie Review: "Epic, Heartfelt, and Inspiring"
Seventy-six years after being created by American psychologist and writer William Moulton Marston and artist Harry G. Peter (with some inspiration from Elizabeth Marston and Olive Byrne), one of DC Comics most popular, most recognizable heroes in its history finally hits theaters and it is a triumph in every way. Not since Lynda Carter donned the red, white, and blue bathing suit in the 1977 television series has a live-action Wonder Woman commanded so much attention. This time we get a wondrous origin story that satisfies and excites but she's wearing armor not a bathing suit this time. While film critics were jockeying to write the nastiest review of the hit movie 'Batman V Superman: Dawn of Justice' the one thing they could agree on was the spark given by Gadot's performance in her introduction as Diana Prince aka Wonder Woman. 'Wonder Woman' picks up where that film left off as an armored vehicle from Wayne Enterprises delivers a briefcase to Diana at her job at the Louvre. It's the photo from 1917 that Lex Luthor had in his secret metahuman files that we saw in 'BvS.' It's at this point we're transported to the island of Themyscira and the days of a young Diana. Jenkins and cinematographer Matthew Jensen create a beautifully lush and vibrant Mediterranean-style island that is home to the Amazons and a precocious little Diana (played in childhood by Lilly Aspell and Emily Carey). She's enthralled by the women-only citizenry that train and yearns to join them. Unfortunately, her mother, the queen of the Amazons Hippolyta (Connie Nielsen) forbids it, trying to shield her from exposing her power as Zeus's daughter. Her origin is a compromise from the comics. She's still molded from clay as her original canon, but instead of being imbued with gifts from goddesses Diana is given life by Zeus. Diana's aunt, the general of the Amazon army, Antiope (Robin Wright), trains her in secret believing she should be prepared if and when Ares returns. The history of the Amazons' origin is brilliantly explained as a bedtime story from Hippolyta to Diana with onscreen animation. Zeus' final battle against Ares resulted in the god king creating the island as a safe haven for the Amazons complete with an invisible shield that hides it from everyone including Ares. The training sequences are awe-inducing from hand-to-hand combat, sword fighting, archery, to archery on horseback it's a dynamic landscape of female warriors. There's also a mixture of diversity among the Amazons as well. Unfortunately, we hear little dialogue from the black Amazons but it would be nice to somehow integrate Nubia, Diana's sister raised by Mars in the comics, in the sequel. Diana realizes she possesses special powers during a sparring session with Antiope. 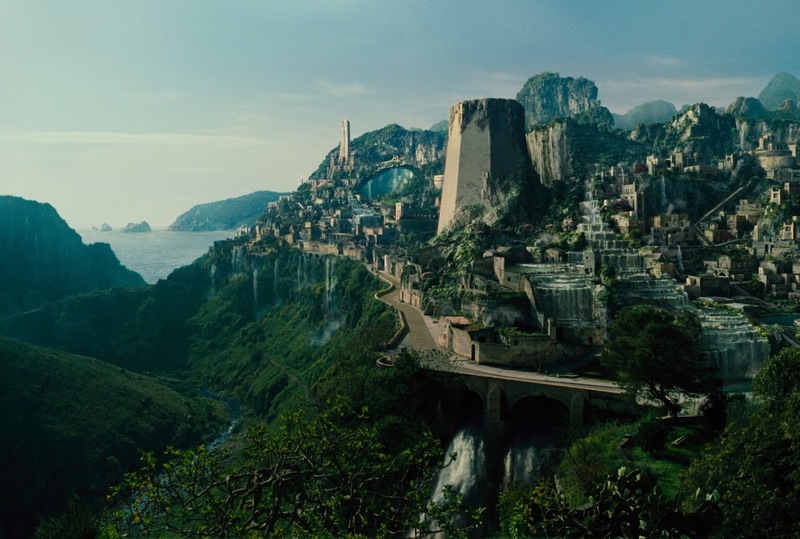 Just then, a fighter plane crashes through the protective shield and into the waters off the coast of Themyscira. She drags out Steve Trevor (Chris Pine), an Allied spy posing as a German pilot, out of the sea and is intrigued to see a man for the first time. There's little time to chat as the flotilla of Germans that were chasing Trevor emerges and a huge battle ensues on the beach. It's a clash of two different civilizations, modern weaponry versus bows and arrows, swords and daggers. 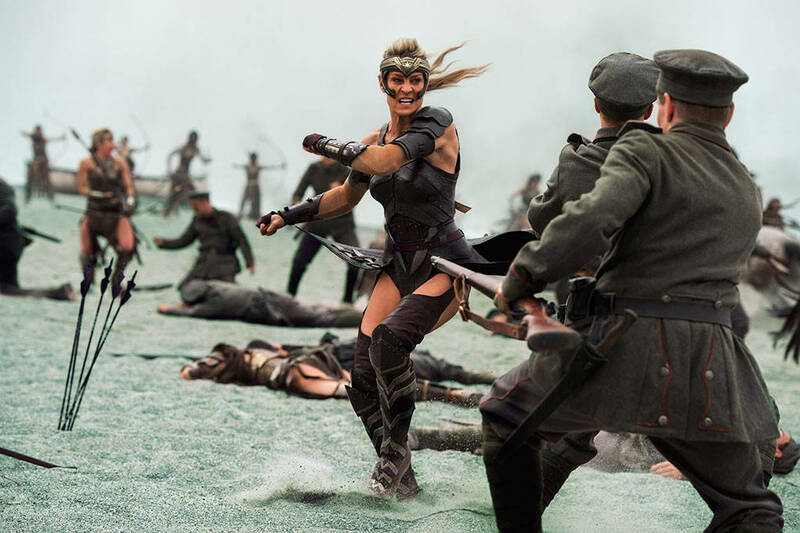 The signature slo-mo choreography of producer Zack Snyder shows through but instead of the buffed male bodies of 300, the women are the buffed out fierce combatants laying waste to the soldiers despite the difference in weapons. 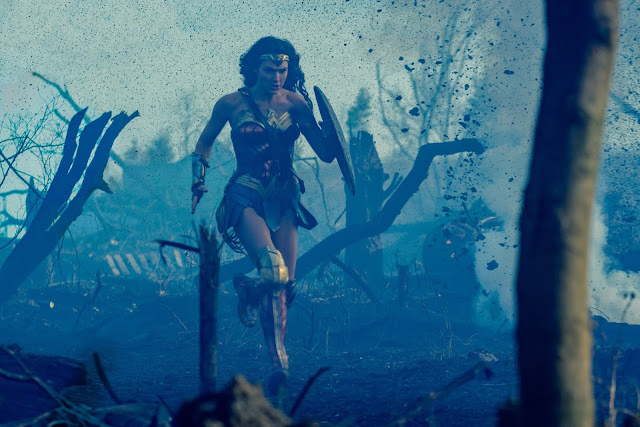 It's a sight fans of Wonder Woman have waited for so long and it's spectacularly shot, adrenaline-fueled, and ultimately bittersweet. Soon after, Steve's objective is revealed and despite Hippolyta's objections Diana decides to return to London with him to help fight in World War I. The relationship between Steve and Diana was especially important as they spend the majority of the film together from that point on. Luckily, the chemistry between Gadot and Pine is instant and the two play off each other perfectly. It had to work for the movie to work and their banter never feels forced, he's not condescending, she's not naive just uninformed about the norms of "man's world," and her positivity and resiliency makes her an unstoppable force for good. Their conversation about marriage leads to some funny lines about man's purpose according to the Amazons. They form a great bond that turns romantic but isn't heavy handed or cheesy. Diana never loses sight of her goal. It's admirable that in a world that is "hideous" and war-torn, Diana takes it upon herself to fight to end the war. Jenkins has said she was partly influenced by Richard Donner's 1978 "Superman: The Movie." The movie that started it all starring the endlessly charming Christopher Reeve as the iconic superhero had humor and action that was steeped in hope and doing what's right. The scene in the alley when confronted with German spies is reminiscent of the one where Clark Kent saves Lois Lane from a mugging. It captures the same magic as Donner's version while showing off Diana's sense of justice and use of fighting skills. If there's a scene that is Diana's coming out party as a superhero in much the same way it was for Superman when saving Lois from falling out of a helicopter he then grabs with one hand, it's the No Man's Land sequence. After imploring Steve to take her to the war they are helped by an eclectic group of allies; a sharpshooter (Ewen Bremner); a Native American scout (Eugene Brave Rock); a smuggler (Said Taghmaoui) and Trevor's secretary, the affable Etta Candy (Lucy Davis). They reach an impasse dubbed No Man's Land where the Germans have pinned down Allied troops. The battlefield is a death trap to traverse for any man. Princess Diana, daughter of Queen Hippolyta and the god Zeus, is not a man at all. She ascends the ladder and steps onto the battlefield in a defining moment. She defiantly faces the onslaught of gunfire, deflecting bullets and mortar shells while approaching the enemy's foxhole. Steve could not dissuade her, could not talk her out of lunging forward where no man had succeeded before. It's what consistently gives Diana agency determining what is best for herself and not beholden to anyone, especially a man. They follow her lead and overcome the Germans. A series of amazing battles follow where Diana gets to toss a tank around, collapse a steeple to take down a sniper, whips around her lasso and fulfills her Amazon legacy as a warrior. Wonder Woman had arrived. 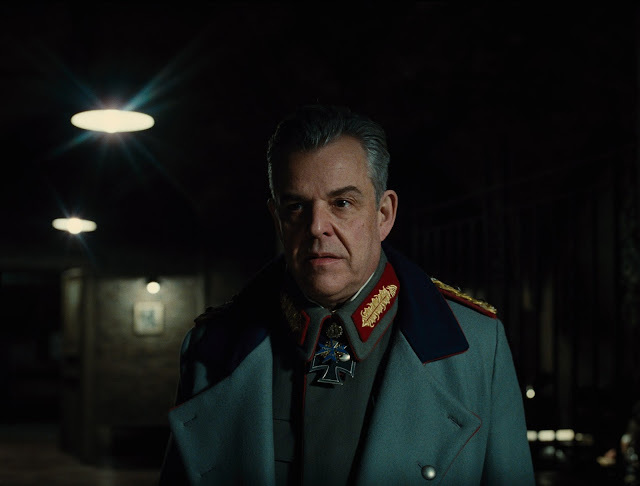 The film's villains consist of a German commander played by Danny Huston who would rather drop chemical weapons on the Allies than surrender and a wicked chemist Dr. Maru (Elena Anaya) aka Doctor Poison. They're not fully developed and mostly one-dimensional characters although there is an interesting scene between Trevor and Maru late in the film. And they didn't really have to be as they serve their purpose as the true villain, the one Diana came to man's world to face, was Ares himself. When they do face off, there's a surprisingly thoughtful philosophical disagreement about what makes man evil or not. Ares says in essence,"Hey man, I don't make them do it, I just give them a nudge in that direction." What happens to Diana crystallizes two things; one, that her belief that killing Ares would make men good was wrong and two, that mankind is complex. But most of all, despite the shortcomings of mankind they deserve mercy, peace, and above all love. Jenkins and screenwriter Allan Heinberg have captured the heart of what makes Wonder Woman exceptional - courage, power, and love. 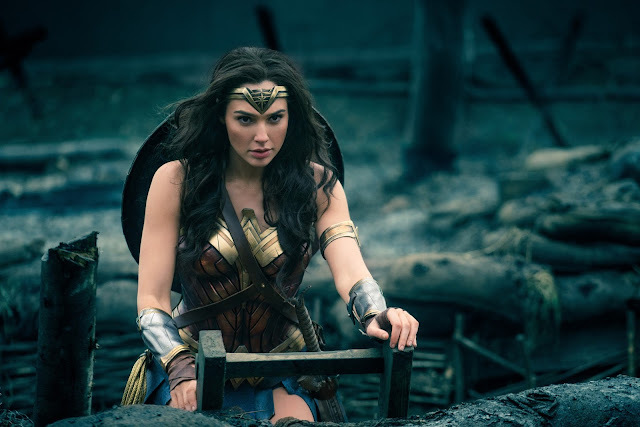 With a star-making turn by Gal Gadot, a charmer in Chris Pine, deft direction by Patty Jenkins and a satisfying character arc that inspires hope and strength in the face of insurmountable odds, 'Wonder Woman' is everything you want in a superhero movie and more.